Make Money, one of our most desired Joomla templates for cash-building solutions, has been translated to multiple languages. Check out how you can open it in your own language! Your favorite portal for free script templates – ThemZa.com, can now be browsed in Bulgarian. 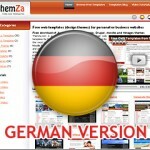 This makes our site available in 7 languages. We are glad to announce that a Portuguese version of Themza.com was launched today. Aftert the release of French, Italian and Spanish versions, the Themza site is now ready to welcome its Portuguese-speaking visitors.